With the time when Leo M. Frank will go on trial for the murder of Mary Phagan rapidly approaching, perhaps no greater reinforcement to the accused pencil factory superintendent in facing his ordeal has been made than that in the person of his mother, who is now in Atlanta at the Selig home. 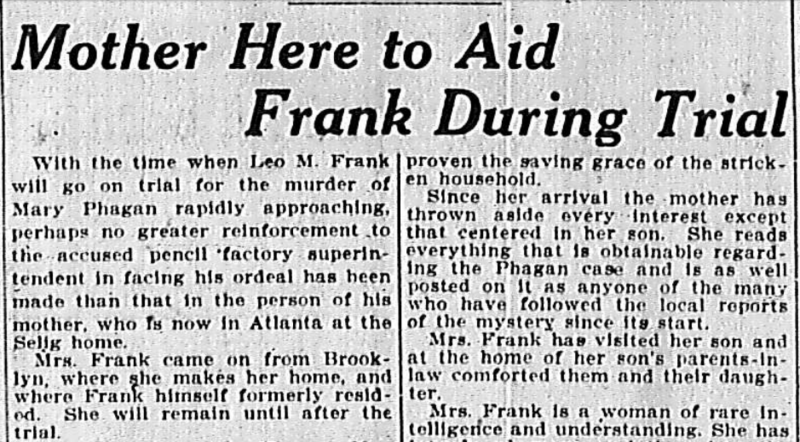 Mrs. Frank came on from Brooklyn, where she makes her home, and where Frank himself formerly resided. She will remain until after the trial. A woman of considerable age, Mrs. Frank has shown wonderful bravery in coming to share her son’s burden. Mrs. Frank has taken her place in the Selig household as the pillar of cheerfulness and hope, friends of the family declare. Her unbounded confidence in the ultimate release of her son, despite the horrible accusations made against him, is said to have prove the saving grace of the stricken household. Since her arrival the mother has thrown aside every interest except that centered in her son. She reads everything that is obtainable regarding the Phagan case and is as well posted on it as anyone of the many who have followed the local reports of the mystery since its start. 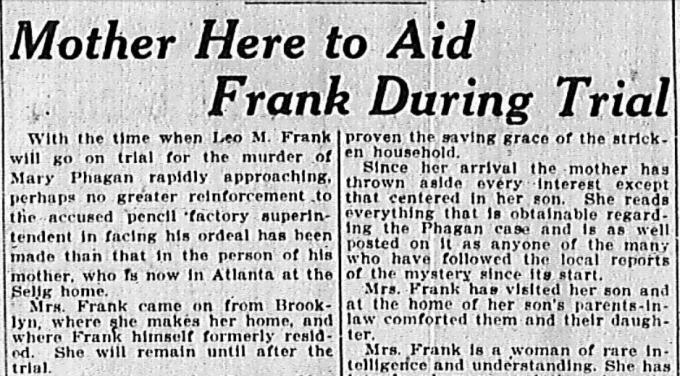 Mrs. Frank has visited her son and at the of her son’s parents-in-law comforted them and their daughter. Mrs. Frank is a woman of rare intelligence and understanding. She has introduced many variations into the Selig home to draw off the monotony of discussion, which has paralyzed all else in the family. That Mrs. Frank will attend her son’s trial is almost certain. Her good cheer is looked upon by all who have met her as an invaluable support for Frank, whose confinement has served somewhat to break down his former health.